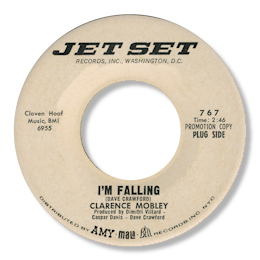 Washington, DC’s Jet Set Records had a few fine releases – Eldridge Holmes’ nicely paced “Worried Over You”, Jimmy Castor’s finest moment “It’s What You Give” and Jimmy Armstrong’s outstanding “I’m About To Say Goodbye” for example – but this double sided winner from the obscure Clarence Mobley is right up there with them. I Knew You When is a fine Joe South down beat number with some tasteful chord changes and Clarence does a fine job with it. His rather quavering delivery complements the feel nicely. Great falsetto finish too. The top side I’m Falling is deep soul in the classic mode – and the addition of a horn section gives the track more “body”. Clarence display a good sense of rhythm here. Note the involvement of Dave Crawford in both the writing and producing of this track.